We think our readership has a right to know who has been telling ASU's stories, so we're continuing our Q&A series with our editorial board with our executive editor, Ethan Millman. I grew up in a typical, not super religious Jewish household in a suburb in Los Angeles. I think culturally that was a big part of my upbringing. I didn’t even realize how much it really impacted me until I came to college and was far away from it. My parents showed me a lot of music that ended up being a really big point of identification for myself. I remember my dad showing me Led Zeppelin when I was seven, and everything kind of changed for me after that. I always remember hearing music in the house. My parents always encouraged me to pursue what I wanted to do, what I thought I found purpose in and not just what was going to be steady. And I think that’s what made me feel really good about going into a career in journalism from a young age. I knew I wanted to do it since I was seven years old, my dad would read the LA Times and I would just sit there looking at it, and I wanted to go for it. When did you move here and join The State Press? I moved here for college in 2015 four years ago, and it's going to be gone soon. I joined The State Press second semester of freshman year. I always figured I was going to join. I remember looking up The State Press in high school, and I always figured I would want to. I didn’t join until later on because I remember hearing in Taylor Place all this stuff about how the State Press kids were intense, and it was almost too intimidating, so that kind of made me feel a little bit more reluctant at first because, you know, when you’re an impressionable freshman, what all of your new friends are saying is what really impacts you. Eventually I realized I want to be a writer, and I wasn't writing. I was a part of Blaze Radio, which I ended up doing for a while and really loved it. But I wanted to be a reporter and a writer, and I was not doing that. And I thought, well, 'Why aren’t I doing that?' 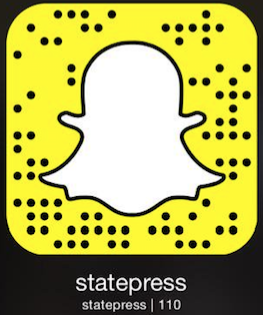 So I ended up coming into State Press, and it had a really quick, immediate energy to me. I think that comes with ... being around a lot of people your age, all pursuing the same goal as you was really exciting because you don’t get that all the time. It’s very unique when you get to be around a publication filled with nothing but people of your age, and it makes you all have to approach things and learn things in a different way because you’re all still at a similar learning point. When did you know that you wanted to move up into a leadership role? There was so many things that made me want to move up. I wanted to contribute to that energy in any way I could. And so when I started off as a part-time reporter I just kept thinking, how do I make myself more valuable here? How do I contribute as much as I can? It kept on going toward that same goal of how can I do the most I can for this publication? And, obviously, there were people that made me go after that, my predecessors were people I admired, and still very much admire and wanted to emulate, and I felt that following in their footsteps was the way to do that. Simple — "Almost Famous." I’ve seen it at least 20 times, and every time I watch it, it’s like watching it the first time for me. It’s because it’s everything I identify with. It’s this movie about a kid who loves rock and roll and wants to write about that as a journalist. It married rock music and journalism, which are literally the two things that I care about more than anything else. It gives you that same excitement that you get — I get this a lot with journalism – where you get these little outside of yourself moments where you just stop and think, 'I can’t believe this is what I’m doing.' And I think that I get a similar feeling watching that, and so at the very least, it just keeps on confirming that is what I should be doing.